DONETSK, Ukraine -- The Russian-backed blitz that seemed imminent hasn’t materialized. One reason: confusion about what Moscow and the rebels really want. 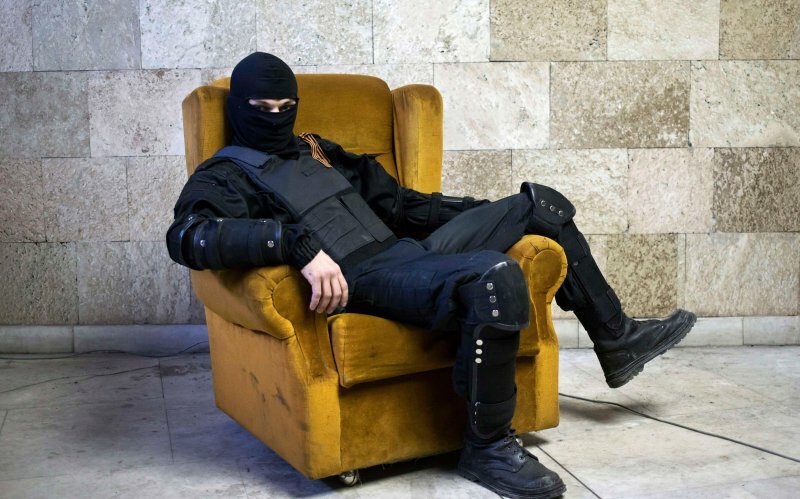 A pro-Russia rebel, in Donetsk. The military commandant in this embattled city, Andrei Shpigel, was having an emotional discussion with officers and soldiers of his “DPR Army” on the veranda of a local restaurant. They were talking about the future of their self-proclaimed Donetsk People’s Republic. Would it eventually become a peaceful region of Ukraine, or be annexed by Russia, or stay an independent but unrecognized separatist territory? For Shpigel and perhaps 15,000 other rebel soldiers controlling this part of eastern Ukraine, a return of Kiev’s legal and military authority over their “republic” would mean potential prison terms and even worse: “mass physical elimination,” they agreed, nodding at each other. The commandant told The Daily Beast that DPR forces would never allow their self-proclaimed republic to reunite with Ukraine. And yet, the struggle for quasi-independence appears to have lost momentum. Then, Kremlin-backed rebel forces launched a violent offensive on Ukrainian positions in Maryinka, a village outside Donetsk city. It seemed that the clashes were going to escalate through the summer, much as they had done last year. As the soldiers tell the story, there was a bureaucratic and administrative problem. “That blitz has never happened because our DPR Army did not support the idea of the Maryinka operation, the attack was conducted by the DPR interior ministry,” Shpigel explained to The Daily Beast. In their ideal reality, the Donetsk separatists would keep all their weapons and power, receive financial support from Russia and do business with Ukraine. But in the real reality people living in rebel-controlled territories are suffering for lack of medicine, waiting months expecting Moscow to pay their pensions and salaries and even to deliver groceries and consumer goods. A commander named Mamai chimes in: “Putin’s man, administrator Vladislav Surkov, is here right now cleaning up the upper circles around Zakharchenko,” he says, referring to the supposed leader of the DPR, Alexander Zakharchenko. But the rebel commanders insisted it’s not just a matter of Moscow making decisions for DPR. “What politicians are you talking about? Today two of our guys with guns can enter any minister’s office and decide politics in our people’s republic,” he said. In spite of the divided opinions and controversial tensions among rebels, Russia has supplied food, gas, clothes and other goods to Donbas residents. On July 16, a caravan of over 30 trucks with “Humanitarian Help from Russian Federation” written on their sides arrived in Donetsk; on Thursday, 100 more trucks loaded with over 1,000 tons of goods reached the border with the rebel controlled territories. A special investigative report by the Russian RBK agency described the complicated subterfuge by which Russian money flowed to eastern Ukraine through South Ossetia, a breakaway Georgian republic that, unlike DPR, had accounts in Russian banks. Was Russian President Vladimir Putin’s strategy to back the breakaway republics, while expecting Ukraine to pay the pensions and other bills? Ukraine stopped paying salaries and pensions to the breakaway republics last summer and today the economy, political scandals and internal conflicts have become the Kremlin’s headache. To provide pensions for over one million retired people in the breakaway territory, Russia had to take a part of the money from its own budget. In interviews with The Daily Beast, residents of Horlivka, Snizhnoye, Rassypnoye, and Grabovo complained about tiny pensions of about $25 to $30 a month. There is also a dramatic shortage of medicine, and speculators bringing medicine from Russia or Ukraine sell it at prices that local pensioners can’t afford. Patients with diabetes cannot buy insulin inside the DPR. A recent United Nations report noted that 8,000 HIV patients have been left without medicine. Russian officials, including Foreign Minister Sergei Lavrov, have pointed out again and again that Russia does not have the money to feed Donbas and that the breakaway territories were Ukraine’s responsibility. So, who would supply medicine to millions of people in rebel republics of Luhansk and Donetsk? Donbas should not expect much from Russia on that front. Its own pharmaceutical market depends on for foreign producers who demand payment from dwindingly supplies of foreign currency. In fact, Russia does not have enough money left to feed itself: on Wednesday, Prime Minister Dmitry Medvedev admitted that there was no money left in Russia’s budget to support 94 so-called "crisis cities" dependent on single industries; about 19 million Russians live in these one-factory towns now without support programs. Maybe the Kremlin should have thought a year ago whether Russia was prosperous enough for a foreign policy that leaves neighboring areas expecting support from Moscow. “Very soon crowds of angry Russians will blame the Kremlin for annexing Crimea and backing Donbas while Russia itself is desperate and hungry,” Timur Olevsky of Rain TV told The Daily Beast. “Under new regulations, Russian law enforcement will have a right to shoot at protesters,” he suggested.